The Gloster Meteor was the first operational Allied jet fighter making it's first flying several weeks after the German Messerschmitt Me 262 jet fighter, the Germans had quite simply used the data supplied by Frank Whittle in his pre-war patent application to design their own engine faster than the doubting British Authorities! Development of the Gloster Meteor was initiated in November 1940, the Gloster Aircraft Company tasking their chief engineer George Carter to design a suitable fighter aircraft for jet propulsion to meet Air Ministry specification F.9/40. The prototypes were powered by two de Havilland Halford H.1 turbojet and were originally caller the "Thunderbolt" but a change of name to Meteor was decided upon in 1942 to ensure no confusion occurred with the existing American Republic P-47 Thunderbolt fighter. A prototype Meteor, piloted by Michael Daunt, first flew on the 5th of March 1943. 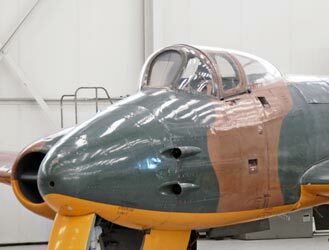 The prototype aircraft were powered by twin de Havilland Halford H.1 turbojets but a change to the Whittle W.2 design built by Rolls-Royce was made on the production Meteor Mk. I's as de Havilland needed the new engines it produced for it's own design, the de Havilland Vampire which remained engine-less since they had been required to also supply the Americans with it's last two remaining Halford H.1 engines for their first successful jet fighter, the Lockheed XP-80 (Lockheed P-80 Shooting Star). The Meteor suffered from stability problems as it reached mach 0.8 as some parts of the aircraft would actually become supersonic as a result of the airflow around the airframe not being constant while other parts would not, a new problem area which was to affect most early jet fighters at speeds which had not been ever reached before, eventually many of the problems would be greatly reduced with the adoption of all-flying tail-planes on later designs. The first Gloster Meteor Mk. I's were delivered to the Royal Air Force on the 1st of June 1944, equipping the RAF's 616 Squadron who used the aircraft to catch and destroy German V1 flying bombs launched against the UK mainland, the first interception occurred on the 4th of August 1944 by Flying Officer Dean, 14 V1's were eventually destroyed. Gloster Meteor Mk. III's were flown on limited missions over Germany from January 1945 from airfields in Belgium but never met or engaged any Luftwaffe aircraft. On the 7th of September 1946 especially prepared RAF Gloster Meteor F.4, at that time painted yellow and nicknamed "Forever Amber" was flown by Group Captain Teddy Donaldson to a world air speed record of 616 mph (991 km/h), this aircraft is shown below in standard camouflage paint scheme. Gloster Meteor F.8's saw action with 77 Squadron RAAF (Royal Australian Air Force) during the Korean War and showed initial success in jet-versus-jet combat against MiG-15's, shooting down five of the newer and generally superior swept-wing MiG's in early engagements, unfortunately on the 1st of December 1951 twelve of 77 Squadron's Meteor F.8's found themselves in a unequal dog fight with no less than 40 MiG 15's and suffered the loss of four aircraft. Group Captain E.M. Donaldson, comander of the RAF's Air Speed Flight, flew this Gloster Meteor F4 to a new world speed record of 616 M.P.H on September 7th 1946 in the skies above Littlehampton. The Gloster Meteor F.8 was the RAF's frontline Fighter from 1950 to 1955 at which time it was replaced with the new swept wing Hawker Hunter. Gloster Meteor production came to an end in 1954, by which time production numbers were approaching 3,900. Meteor Mk8's, as depicted in the above picture, accounted for 1,550 of the production totals and was the first version to be fitted with a Martin Baker ejection seat as standard equipment. It is of note that the Meteor proved so useful as a test bed for ejection seats that Martin Baker was still using three hybrid Gloster Meteor T.7's with F.8 tails for ejection seat trials in 2005, the ejector seat to be tested is fired from the rear position, the Meteors wing mounted engines guarantee that the exhaust efflux from the ejector seat will not enter the jet engine intakes which could otherwise result in a hazardous engine flame out. One Gloster Meteor Mk. I (EE227) was used as a flying test bed for Rolls-Royce's Trent turboprop engines resulting in a Gloster Meteor becoming the first ever turboprop-powered aircraft to fly on the 20th of September 1945. This picture of Gloster Meteor is Copyright © June 2014 Siteseen Ltd. We only authorise non-commercial picture use and particularly encourage their use for educational purposes. This Gloster Meteor picture is not in the Public Domain. 3) Use of this Gloster Meteor picture, or any of our pictures on websites re-distributing copyright free material is strictly prohibited.